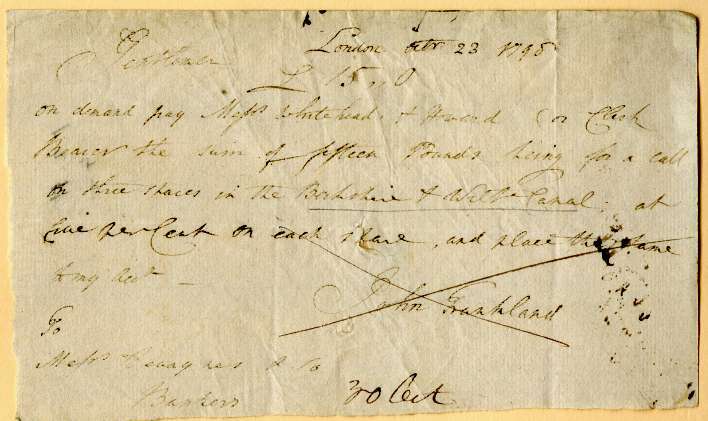 Demand Note issued by John Frankland for £15- to Pay Messrs Whitehead & Howard or Bearer for a call on Three Shares in the Berkshire & Wilts Canal, at five per cent on each Share and place the same to his account with Messrs Devaynes & Co, Bankers in London. This item is over 215 years old. The Wilts & Berks Canal is a canal in the historic counties of Wiltshire and Berkshire, England, linking the Kennet and Avon Canal at Semington, near Melksham, to the River Thames at Abingdon. The North Wilts Canal merged with it to become a branch to the Thames and Severn Canal at Latton near Cricklade. Among professional trades boatmen, the canal was nicknamed the Ippey Cut, possibly short for Chippenham. The 52-mile (84 km) canal was opened in 1810, but abandoned in 1914 – a fate hastened by the collapse of Stanley aqueduct in 1901. Much of the canal subsequently became unnavigable: many of the structures were deliberately damaged by army demolition exercises; parts of the route were filled in and in some cases built over. In 1977 the Wilts & Berks Canal Amenity Group was formed with a view to full restoration of the canal. Several locks and bridges have since been restored, and over 8 miles (13 km) of the canal have been rewatered. A plan for the canal was published by Robert Whitworth Snr. along with William Whitworth, in 1793. The Bill empowering construction of the canal received Royal Assent in 1795. It allowed the company to raise £111,900 through 1,119 shares at a cost of £100 each for the construction of the canal. Another Act of Parliament was passed in 1801 that allowed the company to raise a further £200,000 to complete the canal. The canal was cut during the years 1796 to 1810. Robert Whitworth Snr. remained as an engineer on the canal from 1796 to 1799. William Whitworth was resident engineer during this period and, upon Robert's departure, he became engineer until the canal's completion, for which he was paid £255,262. Following completion, a further two Acts were passed in 1810 and 1813 to alter toll rates on the canal, and another Act was passed in 1815 to allow the company to raise £100,000 to pay off debts collected during the construction of the canal, and to construct a reservoir. The main canal was 52 miles (84 km) long, with branches totalling 6 miles (9.7 km) to Chippenham, Calne, Wantage and Longcot. It was cut to take narrowboats 72 feet (22 m) long and 7 feet (2.1 m) wide. There were 42 locks on the main line and three on the Calne branch. There were three short tunnels. While the main canal was opened in 1810, some branches were operating before this and others added afterwards. The North Wilts Canal from Swindon to the Thames and Severn Canal at Cricklade was opened in 1819; it had 11 locks. It was originally a separate company, but merged with the Wilts & Berks following an Act of Parliament in 1821. Coal came from the Radstock and Paulton mines in the Somerset coalfield by way of the Somersetshire Coal Canal, which joined the Kennet and Avon Canal at Dundas. In 1837 43,642 tons of coal were transported via the Wilts & Berks Canal from the Somerset coalfield, with 10,669 tons being handled at Abingdon wharf. The Wilts and Berks thus became a link in the chain of canals providing a transportation route between the West Country and the Midlands. Water supply was always a problem and a reservoir was constructed near Swindon to supply the canal, now known as Coate Water. The Wilts & Berks Canal was never a great commercial success due to competition from the railways, especially the Great Western Railway from 1841. In addition, long stretches of the canal were through a type of clay that is unsuitable for lining a canal, and so there was a constant need for puddling, making maintenance costs prohibitive. Despite this, the Wilts & Berks Canal operated for more than a century, through traffic had pretty much ceased by 1901. In that year the Stanley Aqueduct over the River Marden collapsed; an event that proved to be the death knell of the canal. Overgrown section of the canal, west of Wantage, in 2006. The canal was formally abandoned by an Act of Parliament in 1914. The Act was sponsored by Swindon Corporation, which gained control of all the land within its boundary. In other areas ownership returned to the owners of adjacent land. From the early 1930s much of the canal was filled in and generally used for dumping rubbish. Chippenham Wharf, once home to Brinkworth's Coal Depot, was used by residents as a refuse tip, and council minutes from 1926 show a decision to dump pig offal in the disused waterway. A bus station was built on the site, the buried wharf being uncovered briefly during redevelopment in 2006. During the Second World War many of the locks and other canal structures were used for army exercises and damaged by explosives. Very little of the old canal survived in usable form, but long rural stretches are clearly delineated.